What pops in your head when somebody says California? Hollywood, Bears, L.A., long stretches of sunny beaches with palms aligned, Beverly Hills, Pacific Crest Trail, Silicon Valley. That’s right, we all think of that first. You most likely wouldn’t think of Sacramento straight away, would you? Yet, you should. As it turns out, Sacramento has quite the number of things to be proud of. And they are all worth a visit or maybe even spending a lifetime. Even TripAdvisor has listed the city among the top destinations of 2018! Yet, no matter how good life in Sacramento is, we all need to see a beach once in a while. And that’s part of California’s beauty – you can live inland, and there would still be hundreds of beaches just around the corner. You can choose to drive to the south to enjoy some of SoCal’s famous beaches, and take a road trip on the way there. Or you can take a break from driving, and instead ship your car from Sacramento to Los Angeles, or San Diego. This way you will be able to enjoy more freely all the beauty of the region – the scenery, the wine, and the food. Even though the trip might be over for you, it’s not over for your car. Don’t forget to take care of it on the way back as well. The transportation partner you choose will make all the difference – choose a company that you rely on every time. Small local companies value each customer for who they are no matter the distance. They would always remember you and your car, even if it is just for a 6-hour ride. Remember that even though the destination and the car make and model are the same, you might get a different price. The cost of shipping a car also depends on the availability of carriers on the days you want to return, or more precisely said on the supply and demand on a certain route. When demand is higher, prices might be higher too. This is why we suggest you get a car shipping quote online and check on prices early before your return date. We recommend booking a service two weeks in advance. Our team will give you a manually calculated price for the best accuracy. Whether you spend your warm vacation days in San Diego, L.A. or elsewhere, remember to return to Sacramento after that! The city is becoming more and more popular these days so don’t miss the opportunity to enjoy it before it gets crowded. If you need a place for surfing, this is the right place for you. Tourmaline Surfing Park, Black’s Beach or Pacific Beach are perfect for a surf or just to enjoy the sunset. And if you are not a surfer, you can still enjoy the sight of locals riding the waves. Just grab a couple of fish tacos and take a sit at the beach. You won’t regret the show. Even imagining the view would make you want to leave your car for someone else to take care of. Yet, you know you will need it once you get there. So, choose someone you can trust, someone who has an experience in shipping a car within California. Corsia Logistics is your partner in this crime. 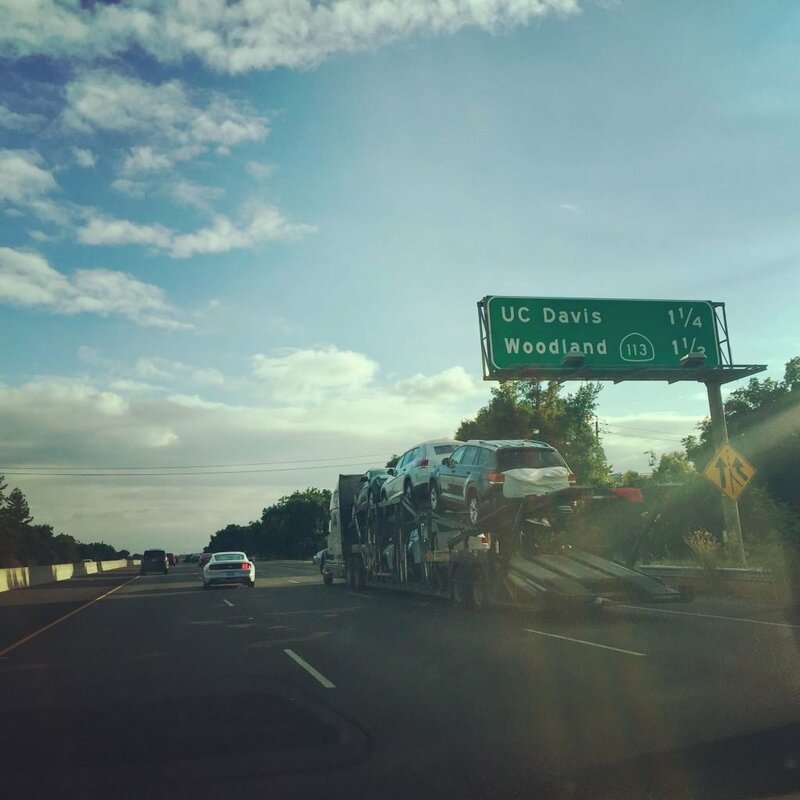 We have our very own enclosed trailer shipping cars from Sacramento and all of California daily. San Diego is more than 8 hours away from Sacramento. It’s not on the other side of the country, we know. But we also know what California weather could be like. If you are looking for better protection, we recommend shipping your car with enclosed auto transport, as it is the option that gives most peace of mind to both the client and the carrier. Enclosed trailers keep your car securely covered inside and prevent it from being affected by road debris or weather elements. Most such trailers are hard-sided and they completely shield the vehicle. They also have hydraulic ramps to hold vehicles horizontally while loading. Such ramps also enable easy loading of low ground clearance vehicles. Keep in mind that this is a pricier option. You can also opt for open auto transport if you want a less expensive option. Either way, select a shipping company you trust, and you won’t have to worry about the safety of your vehicle. Even though L.A. is about 6-7 hours away, there are occasions for which even this short period could be too risky. And yes, we are speaking of those times when you need to transport your most precious vehicle. Your classic or your sports car. Whether it’s a 1967 Ford Mustang GT or a 2016 Ferrari California, it doesn’t matter. It’s important to you, it should be important to your carrier as well. Corsia Logistics has shipped numerous cars throughout the past years. We know that sports and classic cars require even more care and protection exactly because of their higher sentimental value. This is why we wanted to have higher control over the transportation process and we now have our very own trailer to protect your classic, sports or daily commuter you love. Corsia Logistics’ enclosed car trailer gives you exclusivity, security, and peace of mind. The higher level of protection comes not only from the features of the trailer but also from the experience of our drivers. Corsia’s drivers operate enclosed trailers and have experience in handling high-end and classic automobiles. This is the type of service sports, classic and luxury car owners require. This is a white glove auto transport service they require and we provide. If you move there, you will find that Sacramento offers a variety of lifestyles. From the soccer mom to the funky 80-year-old lady that wears a coat of forty colors. There’s a place for everyone. Each of the neighborhoods attracts with its own beauty and charm. Midtown, for one thing, is full of energy and good vibes. You will find twenty-something-year-olds roaming the streets on the hunt for nightlife. You will also see elderly people enjoying the wide collection of boutiques or strolling down Capitol Park. You will see modern buildings as well as Victorian ones, with construction dating from 1910 to the present. Midtown hosts the Second Saturday Art Walks every month. They bring thousands of residents out as they explore galleries and enjoy live music late into the evening. The east side and all areas with parks are also quite attractive both to locals and visitors. More and more people start moving to the city – whether it is by choice or by need. People who struggle to find housing in other big cities in California come to Sacramento with higher hopes. Even if you already live in Sacramento, it’s nice to look at your own town as a tourist sometimes. In our daily lives, we tend to forget how lucky we are to have cozy surroundings. We neglect to see the beauty that so many come to enjoy purposefully. In addition to the modern living, Sacramento provides a good dose of architecture, art, nature, and history. Capitol Park and Sutter’s Fort are must-see sights that your whole family would enjoy. Here are a couple more destinations that might please your soul. … Or simply Land Park is one of the most visited parks in Sacramento. It was created by the WPA during the Great Depression and has pretty much all you need to have a good time there. If you are a true nature lover, you’d be surprised how much you can enjoy there. Land Park is the host of a huge variety of trees and year-round birds. You can spot them while running on some of the jogging trails along with the hundreds of people who run there every week. The park is great for a day with the family, too. There are tons of picnic tables to take advantage of and fun activities for your kids to enjoy – the Sacramento Zoo, Fairytale Town, and Funderland. This bridge is among the most beautiful and unique vertical lift bridges to be found – a true California icon. What makes this bridge unique is that it was designed under the guidance and supervision of an architect, specifically, Alfred Eichler. It is interesting to compare this bridge to the Golden Gate Bridge because both bridges have towers with have bracing covered up and/or carefully designed to maintain the Art Deco appearance. Each year, the city hosts the Farm-to-Form festival where Tower Bridge is a key location. The free festival hosted on the city’s iconic Capitol Mall boasts a delicious selection of Farm-to-Fork offerings that are produced and available in the Sacramento region. The Tower Bridge Dinner is the closing event of this week. Developed in 2013, the Tower Bridge Dinner serves as the finale to the Sacramento Farm-to-Fork Celebration and pairs the area’s top chefs with local farmers to create a one-of-a-kind dining experience atop the Tower Bridge. If you are a movie fan, there is something quite new that the city has to offer to you. You now have the chance to walk around some of the locations from the film “Lady Bird” – one of the movies that stormed this year’s film festivals. It has 5 Oscar nominations and over 80 other wins. A Sacramento tour agency has started a 3-mile, two-hour walking tour that will feature stops at Lady Bird sites. Some of the sites include Club Raven, Pasty Shack, the McKinley Park rose garden. One of the most iconic locations from the film is the blue manse on 44th Street in East Sacramento that served as the title character’s dream home. There is an option for a running tour as well, and if you are lucky enough, there’d soon be a biking one. Whichever you choose, you will be able to hear details about the filming process and the stories of director Greta Gerwig. Who indeed is a local. And she always likes to say that people don’t know what they are missing when they don’t know life in Sacramento. Well. Think about that. California is well-known for its love for classic cars. The state has the highest concentration of classic car owners and traders. You can probably find a fair or a show somewhere in the state every week of the year. The California Automobile Museum is where you should go to get your first dose of classics. Among the current exhibition of modern and fast cars from the region, you will find some iconic ones that will steal your heart. Once in a while, there might be a single collector’s personal exhibit. And that’s a sight that deserves admiration. There are quite a few classic Ford and Cadillac models dating back to the 1880s. It’s exciting to see some classic celebrity vehicles like Gov. Jerry Brown’s 1974 Plymouth Satellite and Malcolm Forbes’ 1987 Lamborghini Countach 5000SQV. If you are a classic car owner this might be the place for you. If not, you might be interested in all the classic shows organized in the region of Sacramento. We at Corsia are always open to giving you advice on shipping your classic to the next show. If you are not an owner but love classic cars, the Museum has another solution for you. You can ride a classic car every third Sunday during their Downtown Sunday drives!